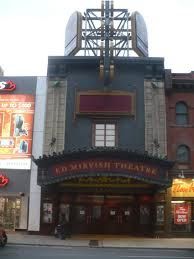 Tonight Teena and I saw Jekyll and Hyde, The Musical at the Mirvish Theater. The review in a moment, first an amusing incident before. We went to eat first at St Louis Bar and Grill in the Atrium on Bay. When we got there, we discovered we forgot our tickets. We sat down and asked the hostess if we could use their computer and printer to print them off. She said she would ask and after 10 minutes, we stopped her to see if she had an answer. Oh, sorry she thought our server would tell us, oh and the answer was no. I can see their point. Security and not wanting strangers on their computer. Then again if we have our tickets, we could stay longer. I then decided to see if there was anywhere in the Atrium that might help us. I saw it was closed and looked over just in time to see the last person lock the doors and leave. But there was a travel agency still open and I thought I would give them a try. I went in and saw two people not on the phone and sat down in front of a girl, said that this was an unusual request and slowly explained our situation, asked them if I could print the tickets on their system . The girl sat there with a vacant look on her face, then in clear English said she didn't understand. OK, fair enough as this is unusual and I explained it again, asked if I could print the tickets and yes, I would pay for their trouble and when finished again, just a blank stare. No "yes". No "sorry we can't do that". Instead she just starred at me. The guy to her left was not on the phone but doing his best to ignore me. No acknowledgement at all ... so I left. Teena decided to head over and give it a try herself. About 10 minutes later, she returned with tickets and knew exactly what I was talking about now, as she had the same thing happen to her. She persisted and finally the fellow beside her heard her say she would PAY and then was helpful. Unbelievable! The blank stares were hilarious. It was great. Going in I didn't know the story but the story was good, the set was great as was the acting. Constantine Maroulis was amazing and what a voice! If there was one complaint it was every song he sang seemed to end on a long high note, but now I am being picky. He was so great switching between the good Dr Jekyll and evil Mr Hyde. When he was good, he was good and when he was evil, he was delightfully evil. I loved how he portrayed Jekyll struggling with the evil beast within him. Deborah Cox also was great in her role and again what a voice! Her duets with Constantine were terrific. Their voices match so well. Teal Wicks was also excellent as Jekyll's fiancee. The Toronto Star did a bad review on this play which made me wonder if they saw the same play we did. I really enjoyed the play and would recommend it. It is not a play I would see twice but am really glad that we got to see it. This production is heading to Broadway in April where it should have a long run.